When you think about great coffee and beautiful design, its hard to imagine a country more suited to combine the two than Italy. With its team of award winning designers, DeLonghi has been producing innovative and unique coffeemakers for many years. The DeLonghi family had already been in business for over 90 years before they turned their attention to the home coffeemaker. With an extensive background in air-treatment products for industry, they began tailoring products specifically for the comfort of consumers in the home. 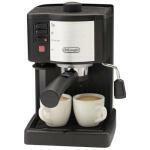 Kitchen appliances followed, with the first DeLonghi coffeemaker unveiled in 1995. 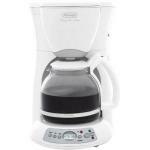 The innovation continued, and in 2003 they pioneered the “Cafe Duo” dual coffeemaker, featuring two insulated carafes and separate timers for brewing. Today, coffee and coffee makers are big business, and the coffee drinking public are ever more discriminating in their tastes, and demanding of the absolute best experience from products. With the bar set so high, does DeLonghi deliver a gourmet quality coffee from their machines as well as a quality product line? Ultimately you must be the judge. 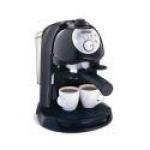 As it is, many users have reported the finest coffee comes from DeLonghi coffeemakers, while others have complained of numerous problems with some machines such as leaks, overheating hotplates, and mechanical breakdown. 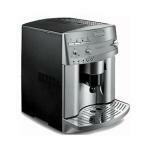 The DeLonghi company, it seems wants to please everyone with its offerings. Some of their coffeemakers are innovative, with dramatic design features while others are rather pedestrian, me-too styles easy to overlook in an overcrowded marketplace. There are some useful features to be found, depending on the model you choose. The â€œAroma buttonâ€ activates a time-release process where the machine pre-sprays the grounds with water, then pauses for the moisture to draw the maximum amount of goodness from the coffee before commencing with the brew cycle. That is a proven method of extracting the best flavor and aroma from your coffee, according to aficionados. One model, the 12-cup DCF212T, (Delonghi is not nearly as innovative with their naming scheme as they are with their styles) features a “Complete Frontal Access System” which allows you to add the water and the coffee without having to lift any lids on the unit. Helpful for tight spaces under cupboards. Virtually all models come with a permanent filter, of the gold-tone variety, as well as the more standard features such as pause-and-serve, water level indicator, and cord storage. Some also feature a brewing timer for added convenience.